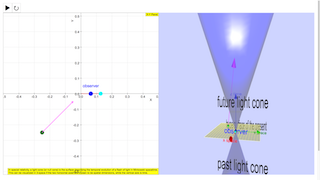 The following simulation was created to help you visualize the light cone (for observer moving with blue dot at the left X-Y panel). Events from three observers are drawed with blue, green and cyan traces. This can be done by dragging their 2D versions on the graph. and watch the difference as you play the simulation.